So says PwC as it publishes a new report calling for government and the EV industry to come together to agree a sustainable and comprehensive roadmap. According to research by PwC, 60% of drivers currently using petrol or diesel cars said they had not considered a battery-powered electric vehicle (BEV) with 51% ranking initial price and availability of charging as the top two barriers. In response, the PwC ‘Charging Ahead’ report says public network investment in cities is crucial in stimulating future EV adoption. 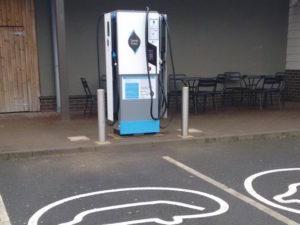 Although EV take-up could be significantly boosted by plans in various UK city centres to restrict conventional vehicle usage following last year’s publication of the Government’s latest air quality plans – Oxford alone is mooting a city centre ban on petrol and diesel cars from 2020 – the report said inadequate levels of public charging infrastructure are currently hampering this. Only 48% of Londoners and 61% of drivers in Edinburgh have access to off-street parking – and therefore home charging. As such, the report calls for data collection on public and private charger usage to better inform city planners and charging operators on required investment levels and the prime locations for charging points – as well as helping utilities better manage power flows across the grid. The report also highlights the need for residential power grid reinforcement and/or the deployment of smart technologies to support home charging. This follows the publication this Wednesday of new study by Aurora Energy Research that sets out how adopting smart charging is key to the integration of electric vehicles onto the power system. Other ‘pinch points’ in EV take-up included in the PwC report include the need for lower vehicle prices and the need to educate the public on home charging and the economic benefits of EVs to boost sales. Rich Parkin, PwC automotive industry partner, said: “Future adoption rates of EVs in the UK will be highly contingent on the evolution of both public and private charging infrastructure and education on the economic and environmental benefits. To download PwC’s Charging Ahead report, click here.